← I will conquer you!!! Damn you bananas, you vindictive, nasty, evil, loathsome fruit you! I’ve figured you out, oh yes, I have. It wasn’t the apples causing women everywhere mayhem. It was you that was the slithering snake temptress! It had to have been, there’s no other explanation. None. You come off looking all healthy and then BAM you stick your sugary sweet daggers into my veins and shoot my blood sugars right into oblivion! Seriously, what the hell is up with this fruit? At first glance, it looks to be a pretty awesome fruit, especially for us athletic folk needing it for muscle recovery and easy digestion. Just look at its stats: A 7-inch banana has over 400 mg of potassium, which is great for nerve and muscle function helping to prevent cramping after exercise, it’s loaded with vitamin C, is an excellent source of B6 and manganese, which is great for bone health and a good-functioning metabolism, it’s got loads of fibre to keep you fuller longer, and is probably the most natural energy booster around. And yet, I eat one, and I’m regretting it for hours after! As a rule, my breakfasts generally consist of steel cut oats with a cupboard full of mix-ins (cinnamon, goji berries, nut butter, flax seed, chia seed, Greek yogurt, etc., etc.) and a half apple side. 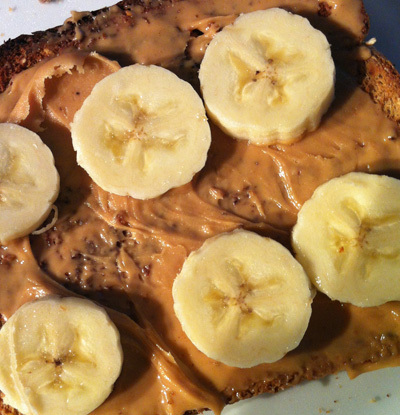 But lately I’ve been craving 12-grain toast, thickly slathered with smooth peanut butter and slices of banana on top. Yu-um. It’s perfect really, whole grain bread, banana, peanut butter, what more do you need? It’s tasty. It keeps me full for hours. Win-win. But then I test my blood sugars. The first morning I had this, three hours later my BG was in the high 14s!!! I thought maybe I forgot to hit the GO button on my pump, but nope, my history showed the insulin had been delivered successfully, so then I thought, it was an infusion issue, but again, nope, the infusion appeared perfectly fine. At that point, that banana was looking pretty darn guilty. However, I still wasn’t 100 per cent convinced. I’d been struggling for about a week with higher than usual blood sugars three hours post breakfast (I know 2-hours is the usual gauge, but I generally wait until snack time before checking), nothing like 14+, but 8 and 9 mmol readings. And so I thought maybe my insulin resistance was all out of whack. Over the next few days, I dropped my insulin-to-carb ratio, and also increased my basal rates for the morning hours. I then went back to that irresistible banana peanut butter concoction. I made sure to measure the banana on the scale for an accurate carb count (previously I had used the general rule of 15 grams per 1/2 banana), and I used measuring spoons for the peanut butter to ensure accuracy there as well. Three hours later, I was registering a BG in the 13s. Are you freaking kidding me? And, you know, when you have a high like this and it makes you feel absolutely crummy, like you’ve been hit by the Bubonic Plague, the last thing you want to do is wait it out, which generally means, you’re spending hours rage bolusing, which then results in hours of post-high lows. Ugh. And you know what happened the third time? That stupid banana threw me for a loop. Instead of skyrocketing my blood sugars this time, it kicked them to the curb! Three hours post breakfast, I was registering 3.5. Seriously, what the hell is up with this fruit??? This entry was posted in Diabetes, Uncategorized and tagged banana, banana and diabetes, banana carbs, hypoglycemia, Type 1 diabetes. Bookmark the permalink. This is just further proof that bananas are evil and must be destroyed! !